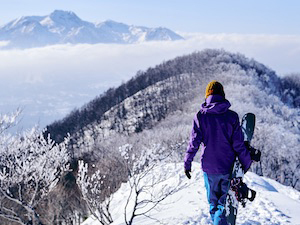 Shiga Kogen has a great number of hiking courses, all different. The most popular one would be the Lake Course, or the Ike-Meguri in Japanese. This blog is to explain the hiking course step-by-step so that you can hike in Shiga Kogen confidently. The hike starts from the Hotaru-onsen Bus Stop. You can get to this bus stop from Yudanaka Station or the Snow Monkey Park Bus Stop by using the local Nagaden bus. 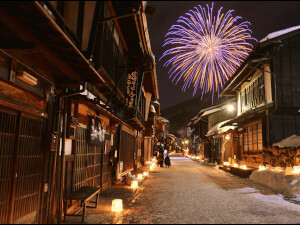 It takes 50 minutes from Yudanaka or 45 minutes from Snow Monkey Park to get to Hotaru-onsen. 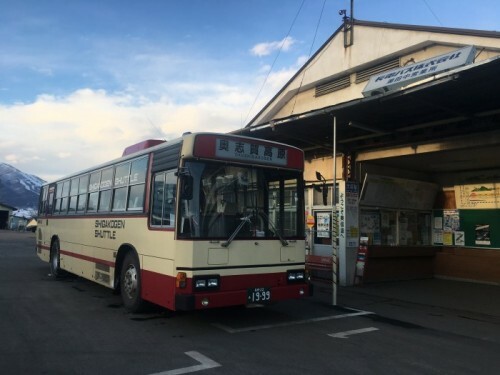 Some bus lines might stop at Hasuike Bus Terminal, the gateway bus terminal of Shiga Kogen. Here you can transfer to get to Hotaru-onsen. Just make sure your bus is heading to Hotaru-onsen when you get on the bus. 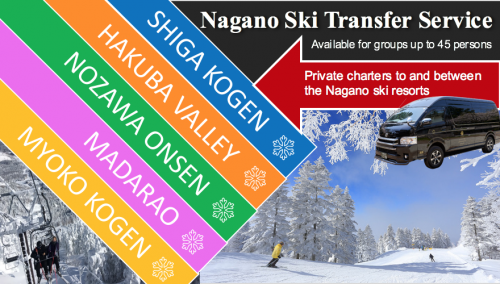 For the bus timetable, please see the Shiga Kogen page in the Snow Monkey Resorts Magazine. 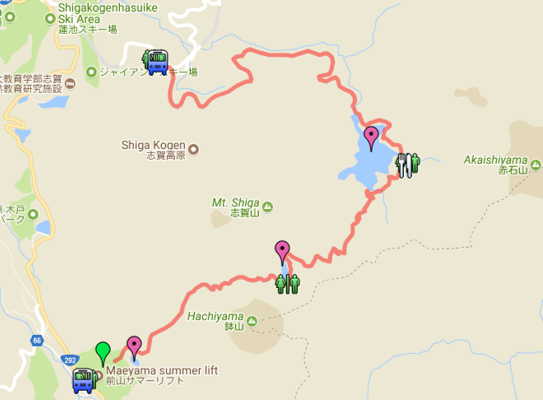 * The Nagaden bus connects Yudanaka Station/Snow Monkey Park/Shiga Kogen area. 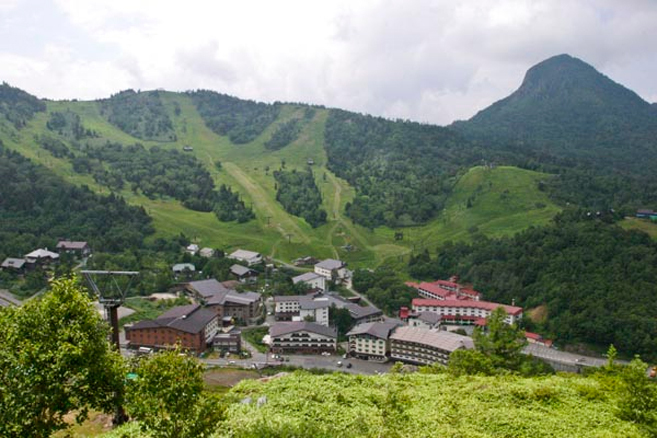 Once you get off the bus at Hotaru-onsen, you can take the Maeyama summer ski lift to the starting point of your hiking trip. 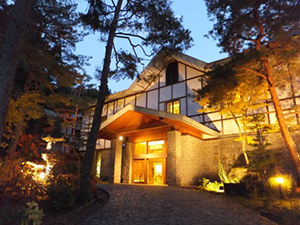 The price of the summer lift is 400 JPY for adults, 200 JPY for children. It’s a relatively short ride of just about 3 minutes. *A view from the top of the ski lift. Once you get off the lift, the hiking path leads straight to the Shibu Lake, the first lake you will find just nearby the summer lift. 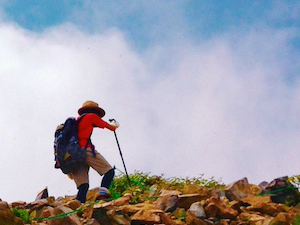 Follow the hiking path further to Mount Shiga (2035 meters high). 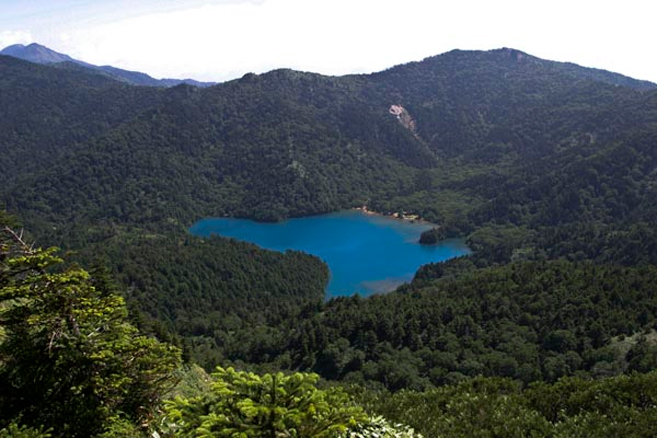 An eruption of the Shiga Mountain many centuries ago created the unique flora and moors of the area. 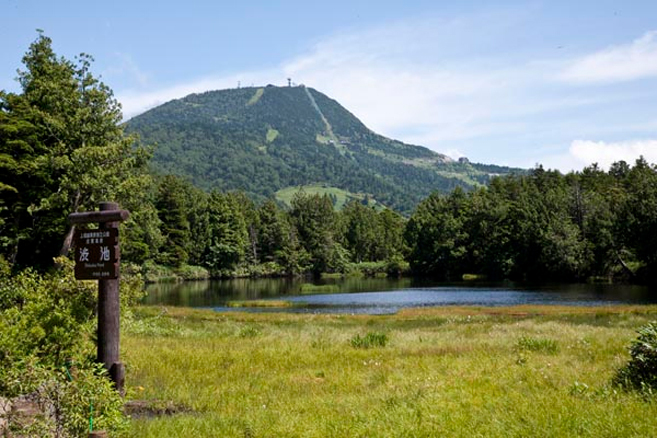 This event had such an enormous effect on the environment that the mountain’s name became the region’s name as well. You can opt to leave the climb up the Shiga Mountain out of your itinerary and go around the mountain instead. However, the view from the top is phenomenal, stretching all over the area and showing all the lakes you’re gonna go past. * A view from the top of Mt. Shiga with Oonuma Lake. Come down from Mt. 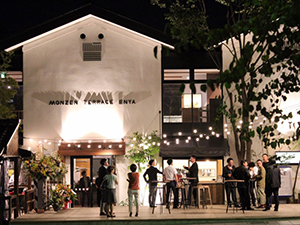 Shiga and walk your way past 48 ponds. The area with the ponds is swamp area, so the plants seen here are of a completely different sort compared to the drier places in the Highlands. * A wood path through 48 ponds. Walk the wooden pathways to the end and get to your final destination, Oonuma Lake. 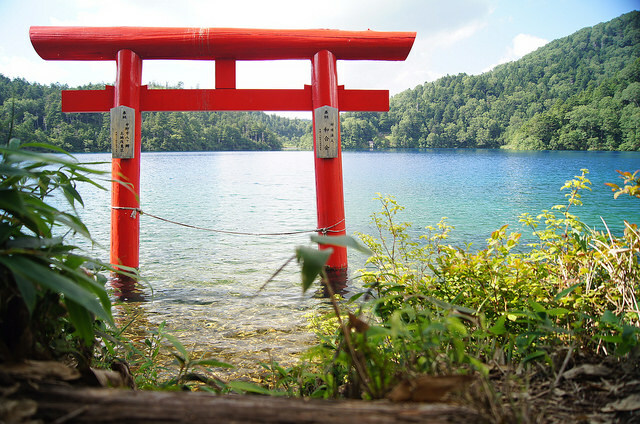 This lake is the biggest in the region and has a red tori (or Shintoist gate) in the water. Its water is volcanic so no fishes can be seen swimming here. 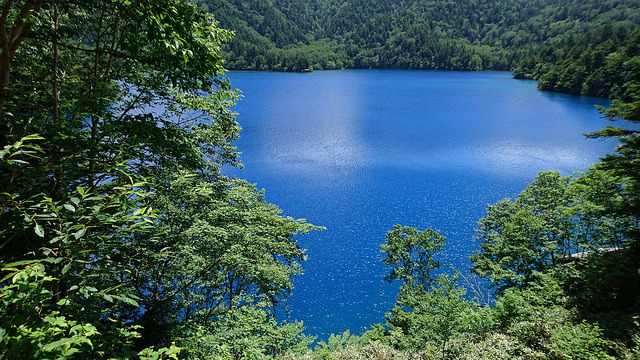 Its acidity however, creates the beautiful cobalt blue color of the lake. There is a resting place where you can rest your feet and drink some water. After your walk around the lake head for the Oonumaike Entrance. 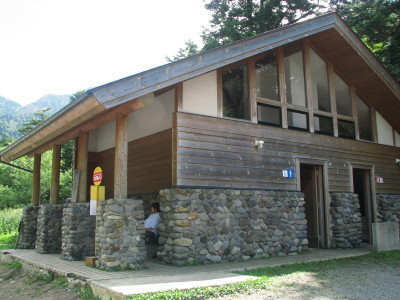 The nearest bus stop, Onumaike Iriguchi is located 200 meters left from the trail entrance. From there you can get on the bus back to Yudanaka or other areas. 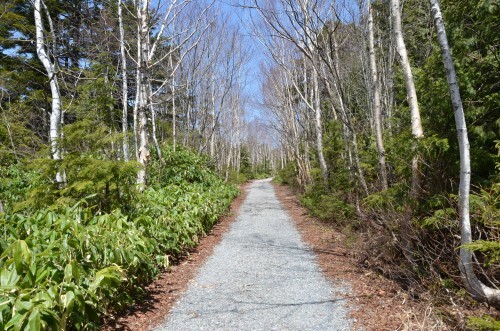 * Trail path from Onuma Lake → Oonumaike Entrance (the path is downhill). * Onumaike Iriguchi Bus Stop. 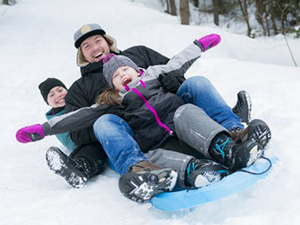 Our advice is to wear shoes fit for walking on unpaved roads and to check the weather report. If the weather is bad, not only are the roads dangerously slippery, the famous sights are probably not visible because of the heavy fog that often lies over the Highlands. Also, make sure to bring a bear bell with you as Shiga Kogen is inhabited by wild animals such as bears, macaques, Japanese serows, raccoons, etc.. 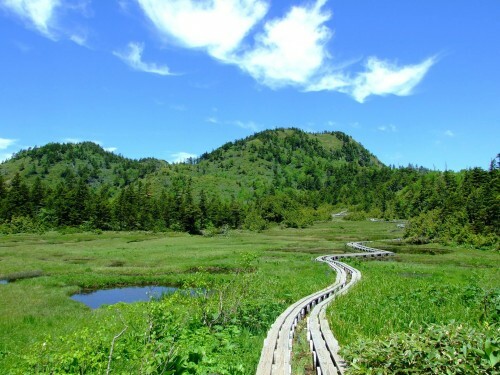 If you’d like to hike this course, there are maps available but they are in Japanese, so please ask for more detailed information in English at the local Information Center.